Sometimes early in the new year I perform an “Airing of the Stash” where I get all my yarns and spinning fibers out and have a look. I will be doing that as soon as I step away from the computer today. Earlier today I did something that I rarely do: an airing of the stash of knitted garments. I opened my cedar-lined, cherry chest which my husband made 35 years ago as a wedding present to me. This chest holds three decades of my adult life in the form of knitted garments. It holds every sweater I’ve ever made with exception of the ones I no longer own. All the baby, toddler, and youth sweaters that my sons wore, all my own sweaters that I do not currently wear, and all the sweaters I’ve made for my husband in past years before I realized that he was never going to wear a sweater of any kind. There are a few precious sweaters that were knitted by my husband’s mother and one of his two delightful and eccentric great aunts. 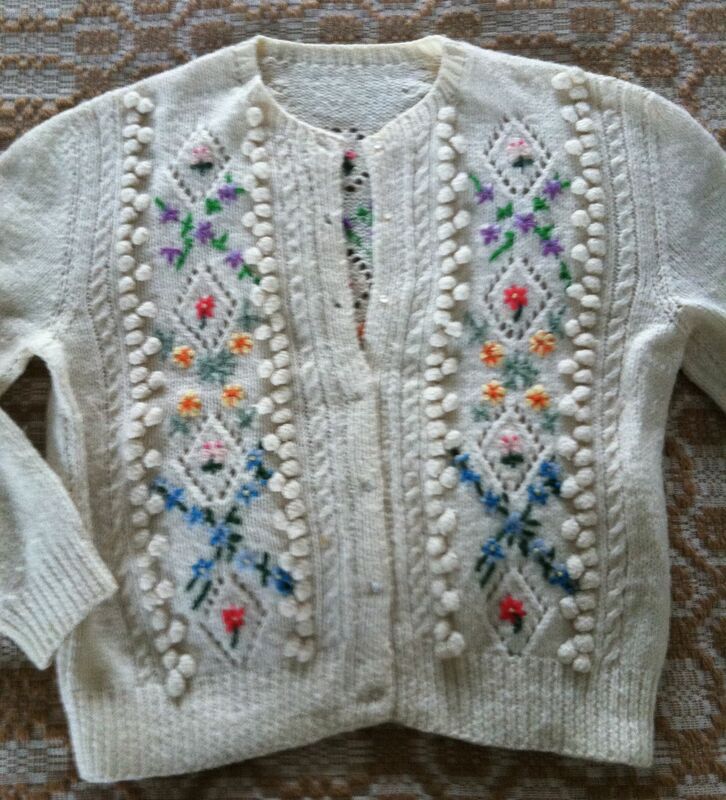 One of her sweaters is a cream wool Tyrolean-style cardigan with vertical columns of beautifully embroidered flowers between the columns of cables, bobbins, and eyelets. You probably know the style. No one does this much anymore because of the labor involved. It is a gem. 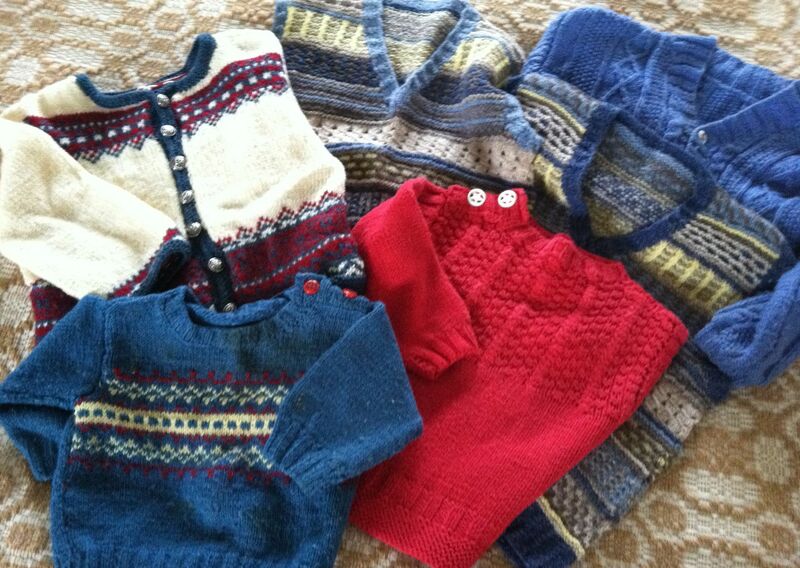 Then there are about a half dozen sweaters that I obviously knit in the 80s… they are painful to look at! During that same decade I was knitting the baby and toddler sweaters that are so classic and timeless, but somehow, for me I was knitting sweaters with styles that could never stand the test of time. I have removed these sweaters from the chest and am contemplating either throwing them out or donating them somewhere. It’s hard to imagine donating them….they are truly awful, their single attribute being that they are at least made from natural fibers. 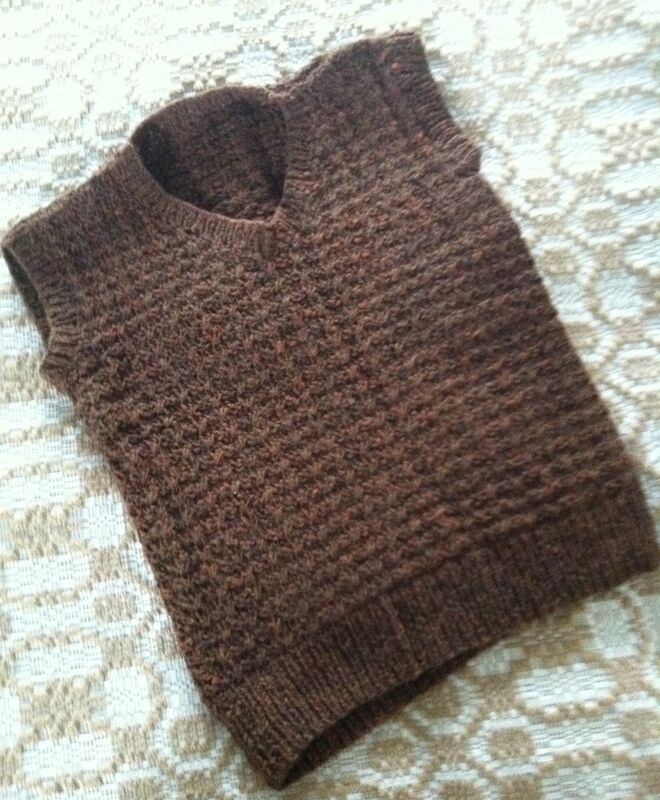 In the chest is my very first knitted garment which must be from the mid-70s, a textured vest pattern from Tahki that was made from their Donegal Tweed yarn in brown with rust colored flecks. I have a clear memory of knitting this vest during numerous evenings, sitting on a metal bar stool in my future-husband’s woodworking shop in order to spend time with him while he worked on a project. Also in the pile is my first attempt at lace knitting….not a shawl or scarf, but a lovely lace Chanel-type jacket that was a Phildar pattern for which I used Phildar’s mohair blend yarn. Sweet, sweet memories! The children’s sweaters bring back a flood of memories. In particular there was one spring when my small community held a fashion show, and I decided to participate by modeling my first Marion Foale’s design, “Badminton,” while both boys joined me on the runway wearing matching cabled vests and coordinating knickers that I sewed for them. (I wore a store bought skirt with a print of ships’ signal flags on a sky blue background.) We were all in shades of daffodil yellow and pale sky blue. 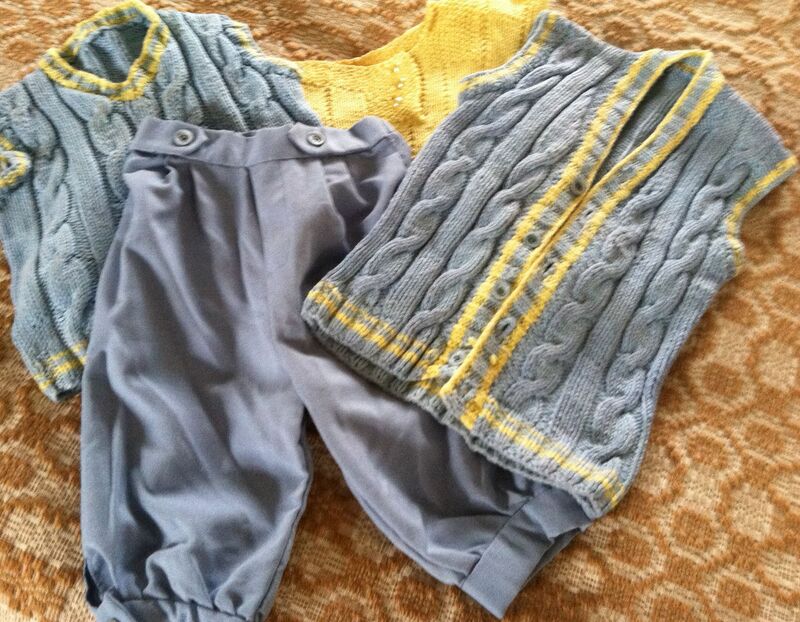 This memory is hilarious to me….my sons modeling in vests and knickers….how cruel! I am sorry to say that the Marion Foale sweater, while classic, has not made the cut for staying in the chest! This trip down memory lane is prompted by our hard decision to leave our current house and move out of the NY metro area. We hope to go back to a slower pace and quieter lifestyle that we used to enjoy when we lived in New England. I know that times have changed everywhere, but we hope to downsize both our possessions and our frenetic pace. Hence, the airing of not only the stash, but everything we own! This entry was posted in family, knitting, patterns and tagged knitting. Bookmark the permalink.